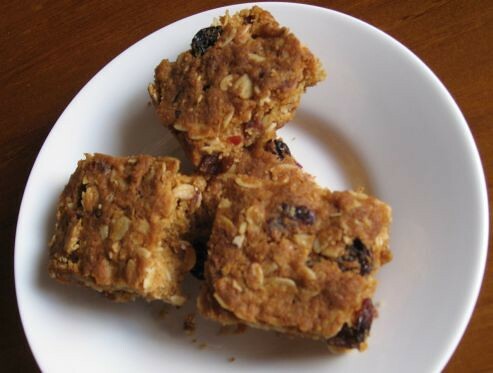 This is a very yummy muesli slice that I have made twice in a manner of weeks. It is that good! I've taken the Recipe from the Women's Weekly Babies and Toddlers cookbook and made some modifications. 1. Combine butter, sugar and honey in a large saucepan; stire over medium heat, without boiling, until sugar dissolves. (I microwave butter and sugar). Remove from heat; stir in remaining ingredients. 2. Press mixture into greased and lined 20x30cm pan. Bake, uncovered, in moderate oven (170C fan forced) about 20 minutes or until golden brown. Cool in pan; cut into squares to serve. Mmmm, I'll have to try this! I even have some craisins in the cupboard. You've been very quiet lately, how is everything going?